I have been in a VALENTINEY mood for 2 weeks now, after playing with the new release Valentine Hanna over xmas vacation! I'm so glad for DOWNTIME so that I can get a headstart on making my own Valentine cards this year! No need to repeat my xmas card fiasco, where I mailed them out 5 days before xmas. Geez Louise, I had a whole year to do them, you would think I could have started a bit earlier than Dec. 19th! Take care and drive safe tonite, everyone! L.
I wanted to post a New Year's card, even though it's too late to really mail it anyway! Tomorrow I'm going to fast-forward to Valentine's day, so I thought I'd at least try to sneak in a card tonite that represents the actual holiday that is happening this week! I'm glad you guys still check in and hang with me even though I sometimes don't post timely stuff. 'Tis the nature of the industry, I guess. What a year this has been. When I look back at the craziness of it, it's been a mix of good and bad... but mainly good. New beginnings, new blog, new responsibilities, new friends. Its nice to just stop, take a breath and reflect on everything that has happened. I went and visited with my girlfriend Janine and her family this weekend, and she commented that we have been friends for 2o years. 2o YEARS! Time just keeps ticking and we have no choice but to carry on, and keep on ticking, right along with it. It feels good to have a fresh start again...out with 2007, in with 2008. The resolution making has begun, the page is being turned. I wish everyone a safe and happy new year; may your celebrations be merry and your time with friends and family cherished. I have a card stash box with cards in it that I've done in the past. I keep them so that if I get in a creative rut, I'll pull one out and reproduce it or change it up with a new stamp set. This one I did a LOOONG time ago, when we used to have more than one stamp store in town (Archivers has now taken over)! I bought this quickcuts bubble gum machine die cut and made a shaker card with beads as the little bubble gum balls. I pulled it out this week because I needed some inspiration, and want to reproduce some generic cards for my card stash. The stamp set is by Stampin Up and is called "So Very"..it was a sell-a-bration set from last year, I think? There is a great tutorial on shaker cards HERE at Splitcoast. Paper is My Minds Eye Magnolia "Sundance "The best of Friends" dots, brown. Top secret stuff being made here in St. Paul tonite. No postie but there's caaaaan -deeeeee! A quick post tonite; I'm trying to shovel out my house again as my girlfriend Jillie is coming over to stamp tomorrow night! I did these cards a while ago with scraps of Basic Grey paper that I had. I bought this Lizzie Ann High Hello's set from Eclectic Paperie in my last order because it has such different sentiments on it. That's what usually pulls me into purchasing a new set...if it's different & has coordinated sentiments that match the images! The card on the right was an experiment...I put a scalloped rectangular piece of cardstock over the top of the tree image and then colored around it to create the reverse scallop border. It looks like matting but is really just copic markers colored in around the edges. Didn't work so well, I think I'd opt for an extra mat next time! LOL! SO much to share tonite! Aaack! Where to begin! First, I'm so very happy that the holidays are almost over so that the running around can stop for a while now! I need to pick a Crafty Secrets blog candy winner pronto! So lets do that first so that I don't leave you hanging! 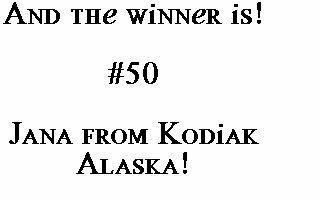 Jana from Kodiak Alaska, you are the jittery winner, girlfriend! Send your snail mail address to me and we'll get your goodies out to you! And you have to post your eye candy for us too! Look how cute she is! (Jana's Blog) Congrats! I loved reading eveyone's stories...I swear, stampers are the sweetest bunch! This weekend I stamped all day on Sunday, so I have tons of new stuff to show you. I made a TON of Hanna samples with the new set that will be released on January 4th! But I can't post any until this Monday! DANG! I DON'T KNOW IF I CAN HOLD OFF THAT LONG! I'm not very good at keeping secrets! Ok. So we'll do Elzybells instead. I'm re-naming them LZ-bells because I'm now addicted to these sweet little girlies. Friend HB scored this one at Crafts Direct (St Cloud, MN) for me with a 50 percent off coupon. I LOVE COUPONS! I'm not sure who sells these online so I don't have links for you, but A Muse reps them so I'm sure your local A Muse retailer will have them. This is a PERFECT winter stamp because you can use fun bright colors with her & it doesn't look odd. On these cards I am using up some old My Mind's eye papers, and some Daisy D's snowflake paper from their "Snowflakes & Holly" line. They are colored in with copic markers & I added small pink buttons everywhere. The "Hello good friend" stamp was sent to me from sweet blogger Michelle Kovack. (Studio G). I also have to show you my Pottery Barn score. All of their Christmas ornaments went 50 percent off today, so I ran at lunch and scored some of these vintage glass glitter birds that I've been eyeing for weeks. They look so cute in a nest of vintage ornaments! I also scored some vintage mercury glass ornaments...regularly $16.00, now $7.99. They go perfectly with vintage ornaments. You get 12 of them in a box, for $7.99! It's a great way to get cheap filler ornaments if you don't have a big collection of vintage ones yet. These are new, but they coordinate perfectly with older glass ornaments. I will put these away for next year's decorating, and keep an eye out next summer when junking season hits for more old ornaments with that pretty shabby patina that I love so much. Hope you're all getting stamping time in this week! L.
Crafty Secrets - My Favorite Things! YAAAAAAAAHOOOOOO! IT'S MY TURN! Sweet Sandy Redburn from Crafty Secrets let each design team member pick out our favorite Crafty Secrets stamp set, cotton scrap and booklet to give away! My drawing will end this Wednesday, December 26th, so make sure to leave me a comment here to enter the drawing! I'll draw on Wednesday evening after I get home from work! POO. I only have Monday & Tues. off because I used up all of my vacation days. So I chose the Coffee & Tea Chickies as my favorite set! I had so much fun playing with this set right off the bat when it was released, and the sentiment completely fits my humor perfectly. It is the most special set to me because I was so thrilled that the cards I made with it were used in Crafty Secret's ads (CHA Chicago). To be featured next to the work of Vicki Chrisman, Anna Wight and Julie Ebersole was unbelievable to me! I am *so* not worthy! This set will also be featured in an upcoming article along with 5 new cards of mine in the upcoming Spring issue of Take Ten. To enter, leave me a comment on this thread and tell me about the most special moment you had this year during your holiday celebrations. Hope your holiday is filled with many wonderful memories and special moments. Are you revved up for another Crafty Secrets blog candy give-away??! Make sure to check back this weekend, as I will be posting a blog giveaway of my favorite Crafty Secrets things! It's my week this week & I'm so excited! Hopefully you've been following the Crafty Secrets design team blogs, as each DT member has or will be doing a give-away! There are 3 left, Mishie Wooderson, Vicki Chrisman & myself! I'm was working on gift bag and tag ideas for the Crafty Secrets gallery this month, and finished this shabby snowman bag last weekend. It started out as a cheapie Target clearance giftbag, but I loved the "soft sky" (SU) color of it. I glimmer misted it with iridescent gold glimmer mist, and then stamped music notes (Crafty Secrets Altered Art set) and snowflakes (Crafty Secrets Vintage Christmas set). The music is actually vintage sheet music, which I picked out specifically for the words...I loved that the song had words like "laugh and joke", and "no matter the weather"..they just seemed cheery and appropriate for snowman building! Normally I would distress the paper edges but because of the paper's brittleness I just left it alone. The snowman image is from Crafty's "Winter" Cotton Scraps, which are made from a high quality twill fabric & can be sewn or glued onto cardstock or fabric. Then I got putzy with a tag for the top of the bag...I used a regular ivory colored tag (Paper Reflections) and distressed it with soft sky & Caribbean blue SU ink. I cuttlebugged it with my snowflake embossing folder, then glimmer misted it first with snowflake color, then with iridescent gold. I dried the tag with my heat gun, then ran Caribbean blue ink across the top of the snowflake to pop the embossing out more. I finished by distressing the tag edges with brown distress ink, and adding more sheet music and "To/From". I think this photo picks up some of the tag shimmer so you can see the detail. Stay tuned for my blog candy give-away..I'm waiting for the photo to arrive and then I'll give you the heads up to comment! Do you guys make your Christmas tags every year? When I wrap gifts I always feel like the tag should match the wrapping paper. So I make them every year, using stamps that match the theme of the gift wrap that I buy. I usually hit Target for their Christmas clearance, and get the wrap for 75 percent off the year before. Last year this was my clearance wrapping paper. Tonite I started wrapping gifts with my clearance paper, and frankly, I'm so exhausted that I just don't have the energy this year to go nuts making the tags. (I cranked out all my Christmas cards last night, so I'm a little stamped out right now!) So I decided to go simple & just cut the tags, Cuttlebug them with the snowflake embossing folder, and glimmer mist them. They have a bit of a shimmer and some texture, and look just fine with the wrapping paper. I started with tempting turquoise paper, and then spritzed them with silver glimmer mist. After I dried them with my heat gun, I ran my Caribbean blue ink pad over the top to pop the snowflakes out. Quick and easy! I get *SO* into wrapping my gifts & decorating the packages with sparkly tinsel, that sometimes the gift wrap eclipses the crappy gift inside! This weekend at a girls stamping get-together at my house, I was experimenting with making custom gift wrap with the new swirly Crafty Secrets "Mini Memories" stamp set. I started out with basic shimmery gold tissue paper & discovered quickly that when the surface is too shiny, nothing sticks to it except embossing powder. I stamped the red medallion on the shiny side of the paper with red cat-eye pigment ink thinking it would work, but when it dried, the color completely disappeared. But I turned the paper over, and the reverse side of the paper was actually sort of vintage-pretty! So I used it anyway! The 2 gifts on the left were wrapped using the dull side of the tissue paper. The gift on the right was done by heat embossing with red embossing powder and versamark on the shiny side. So you get 2 fun effects, shiny vivid, or a vintage shabby patina. I took my cue from the gift wrap colors to make my shabby tags, and pulled paper from Crafty's Earthy Paper pad that had reds & golds in it. The music is actually vintage sheet music that I scored at a thrift shop! I stamped the red medallion partially over the music to add some interest. 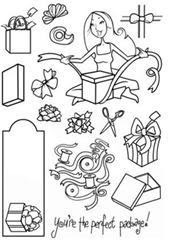 The angel & heart images are from Crafty's "Heavenly Christmas" sticker line which are a bargain $2.35 per sheet! After I finished with the tags & the gift wrap I decided to do a calendar. Since I was already using the reds and golds, my eyes naturally gravitated to this brocade-looking paper from Crafty's "Classic" paper pad. The beautiful image is from their 'Seasonal" booklet. I added velvet rick-rack and more sheet music to complete this. The back of the calendar was another boo-boo. The calendar was a bit larger than the paper I had, so I had to piece some sheet music onto the back because the paper didn't cover it completely. So the bottom of the back of the calendar got more music on it. What a DAY! Oh my!!!!! I'm finally sitting down here to post & choose a winner for the Hannacandy "Tis the season" stamp set! It's been a crazy day that started out with friend Bethie choosing me to be the featured stamper over at Splitcoast Stampers! It is SO much fun seeing everyone's tweaked versions of some of my cards in my Splitcoast gallery! EVERYONE STAMPS WAY BETTER THAN ME, I'M FREAKING OUT AT THE TALENT OVER THERE! So I'm a little late to the party again, I had to go over and check everyone's cards out that played in the challenge! First order of business: we need to choose a winner! ONE MOMENT PLEASE. OK! HERE WE GO! AND THE WINNER IS!!!!!!!! NUMBER 23! WHICH HAPPENS TO BE MY BIRTH DATE ALSO! YIPPIE! *VIV*! My email address is to the right, just send me an email with your address & I'll send out your Hanna! Here is one of the projects I worked on this weekend for the Crafty Secrets gallery. Our theme this month is "New Years". I found this great vintage floral image in Crafty's "Seasonal" booklet, and it had this sweet girl popping the cork on a champagne bottle. I used a chipboard frame from a new product that Crafty will be releasing in January, and covered it with Martha Stewart Yellow-gold glitter. The sheet music is real vintage music that I found at a thrift store for cheap. The fringe on the top of the hat is iridescent shred that I use in gift wrapping. I thought it would look pretty and sheer so that you could see the beautiful paper that the hat is made of. The floral paper is from Crafty's "Radiant" paper pad. One more thing...for the next few weeks you will see blog candy being given away at all of the Crafty Secrets Design team blogs. This week, Anna Wight will be giving away her favorite Crafty products. Check out her blog for her blog candy giveaway! 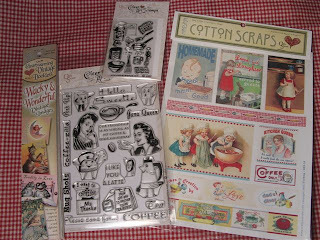 Hanna Stamps New Release & Blog Candy Today! Today is the day! Kristi from Hanna Stamps has unveiled the 2 newest stamp sets, "Perfect Package" & Things Hanna Would Say! Both sets are now available on the new Hanna Stamps Website. I played around with this set a little more last night, and did one more card sample. I got really putzy with this Hanna & created a little "cutaway" border with the scissors in this set. The dotted line is from a new Crafty Secrets set which is yet to be released in January. I HAD to sneak it in & use it here though, I wanted the border to look like the scissors is cutting gift wrap or a coupon or something. The gifts are paper-pieced (stamped on patterned paper, cut out & adhered to center image). I need to buy the other set of Nestability circles so that I can mat my circles. Until then, I've just been running a line of glitter around my circles so it looks like they're matted. I'm on a "spending freeze" as friend Lana L. calls it. I will get them eventually! So I thought it would be fun to use the gift & ribbon rolls stamp from the new release Hanna Stamp set, "The perfect package". The ribbons stamp is a small square one, so here I've used it multiple times to create my own patterned paper border by stamping it across the entire bottom of the card. I colored them in with copics (not very well now that I look at it!) and then filled in the brown ribbons with brown fun-flock to simulate velvet ribbon. I have not started cranking these out yet, but at least now I have a design and am ready to reproduce them after Christmas. Christmas cards, I gotta do xmas cards! This set will be released on this Friday. The sentiment is from the soon to be released sentiment set, "Things Hanna would say". Tomorrow night: Hanna blog candy! My friends will tell you that I'm almost always late to every party, so why should my blog be an exception? I am HORRIBLY late in wishing congrats to the two newest members of the HannaStamps design team, Sherry Cheever & Jeanne Streiff! Both of these talented stampers need no introduction, as everyone is VERY familiar with their unbelievable work! A late congrats to you both, we anxiously await your Hanna eye candy! And congrats to Kristy from Hanna stamps also! She is rocking our worlds with a new release stamp set! AIR FIVES! The newest Hanna set will be released on Friday, and is called "The Perfect Package"! It is the GIFTIEST Hanna set yet! And Hanna is already a very GIFTY girl! You will start seeing lots of sneak peeks on the Hanna design team blogs on the links to the right...we all just received the sets this week & are as busy as Santa's elves, trying to HANNIFY our cards! This is my first attempt with the newest Hanna set...I bought this little wooden "gift bag" box at Michaels in the alterable wood section a while ago. I had it in my head that I would make a box for my Christmas receipts to go in. I'm not very organized, and every year, I end up with receipts everywhere in my house. Makes it sort of hard if I need to return gift items I've bought for people! So this year, I am ORGANIZED! I am promising myself that I will PUT THE RECEIPTS IN THE HANNA BOX! DOH! I used polka dot paper from My Mind's Eye (Tres Jolie Ooh La La "Sunshine Polka Dot" and "Just Perfect") & then colored Hanna in with copic markers. The ribbon has been glitterfied with a sparkly light blue glitter. I have determined after scrapping about 5 Hanna images, that I just cannot use Stampin Up paper with my Copic markers. They just show up so much better on the cheapie Wal-Mart brand paper. Live and learn! Just a reminder, the Crafty Secrets Design team will have a series of blog candy giveaways for the next few weeks! 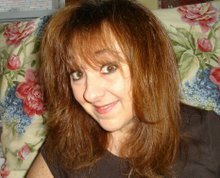 This week is sweet Linda Duke's turn to give away her favorite Crafty Secrets products! Head on over to Linda's blog HERE to get in on the drawing! We will post notices in the Crafty Secrets forum at Splitcoast so you'll know which team member is having the give-away each week! 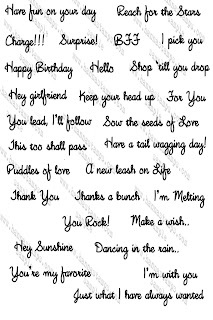 I ordered a Lizzie Ann stamp set from Eclectic Paperie called "High Hellos" because I loved that this set has such different themes to it, like cheer up, reach for the sky, etc. I am always in search of sets that are a little 'different' from the rest...I've found that the more stamps I have, the less I go for the 'same old, same old'. I started playing with these little rockets & blue glitter. These would be great for 4th of July cards, too, now that I see them up on the screen. I paired them with my Daisy D's red polka dot paper & Deja Views striped "Candy Cane" paper. The little metal anchor turn is from Oriental Trading. The tree is up, the house is decorated! YAY! I spent yesterday decorating my house for Christmas finally! It's absolutely the best when you can have the warm glow of Christmas lights throughout your house. Here is my tree all lit up at night. Remember those little round boxes? I found them junking this summer at my neighbor's house. I've been waiting patiently to put them under my tree! YIPPIE! If you follow my blog, you've seen me post photos of my junkin finds. Sometimes I don't know what I'm going to do with stuff I've bought until the inspiration hits me. Here's a smattering of photos showing you what I've done with some of my finds. This cupboard was given to me by my parents for Christmas a few months ago. We were junking in Buffalo MN and I fell in love with this skinny little cupboard. It's made from weathered barnwood. It didn't need much to make it festive...some fake greenery & a few pepperberries dress it up. Sweet blogger friend Chelemom sent me the cute little decorated vintage postcard. THANKS CHELE! I loved these shiny bright Christmas ornament boxes that I got from my Grammie. I decided this year they should be part of my decor. This is the top of my built-in buffet cupboard in my dining room. This little swedish doll was .10 cents at a garage sale by my cabin. She's coppin' a squat on some round faux gifts (hatboxes) that I found at my neighbor's garage sale. My neighbor is a photographer, and they used to be photography props in her studio. Every year I put bowls of shiny ornaments around my house. They catch the light and shimmer so prettily! I'm not sure what these little star/snowflake metal things are...I'm assuming they must have gone over vintage christmas lights. They are very tin-like. I scored a bag of them for .50 at a garage sale. Remember all of these .25 cent muffin tins? Since I have no use for them in the kitchen, I'm displaying ornaments in them. These were gifted to me from my Grammie. Here is what my tree looks like in the daylight. Just a hint, if you're photographing your Christmas tree, set your digital camera on the "night" setting. It will give a warm glow to your photos and captures the soft glow of the Christmas lights. This photo and the top photo were taken at the same time...this photo is taken without the "night" setting on, and the one at the top has it on. 16 days left until Christmas! OOOH I wish they'd fix the banner issues! It is CHRISTMAS TREE day here today! I'm digging out the year's worth of Christmas junking finds & gathering it all to go onto my Christmas tree. Which has been sitting here NEKKID for almost a week. Today I will decorate! Every year I end up with a new assortment of ornaments from my junking adventures. I also have some junker buddies looking out for me, so many of these items have been given to me by sweet friends or family, who know of my love for everything vintage-xmas! These pink shabby ornaments were in these original boxes and I paid less than $2.00 for all of them! There are 5 sleeves of them! The sweet little green box with silver ornaments was gifted to me by Pam Hooten. I have a tiny silver tree that they can go on, but actually, I may just display them in the cute green box! I LOVE the box they came in! Check out these little glitterfied birdies! These are from Heather Nichols (Pinefeather). They were in her husband Chad's family, and she thought that I'd be able to do something fun with them. OMG I was so excited to see these guys! I'm ALL about the glitter! Now that she's got her own Etsy store with vintage finds, I told her "NO BACKS", I'm keeping these birds for my tree! This box is from my Mom...she got it for .50 at a garage sale. She said "some of them look pretty shabby, but you can pick the cute ones out". I said HELLO! I'm *ALL ABOUT* the shabby ones! I have to admit I'm a bit of a slacker. This "Winter Dreams" banner has been up since last Christmas. I love that it's so glittery and couldn't bear to take it down after Christmas last year. So I kept it up, and pretended even into the summer months that I was dreaming of winter. (SO NOT TRUE). So I'm off to decorate. I'll post a pic of my tree later so you can see all this stuff on the tree!